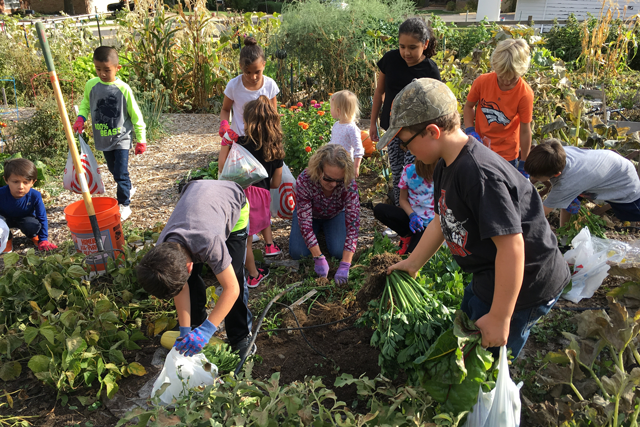 The Birch Community Garden in Broomfield, Colorado, benefits local children and seniors alike—and grows some 1,000 pounds of produce a year. 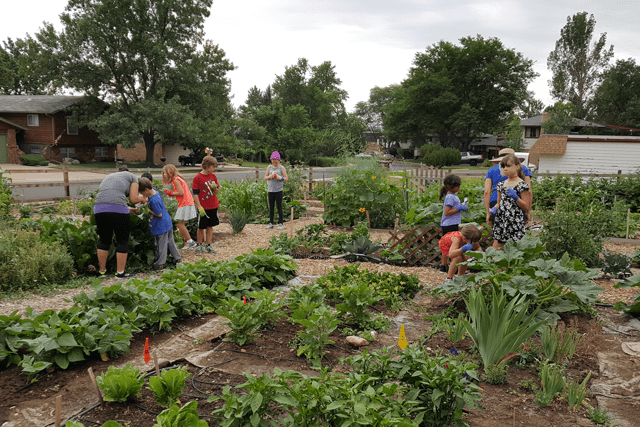 As the volunteer coordinator of the Birch Community Garden, Sharon Josephs has watched vegetable converts firsthand, many of whom are children who attend the after-school program at the Broomfield (Colorado) Corps, where the garden thrives each summer. For the last six years, Josephs has been coordinating the volunteers and teaching the kids in The Salvation Army’s after-school program about gardening, including everything from beneficial plants to watering requirements, good and bad insects to how to harvest and cook with the vegetables from the garden. Over the years she’s seen many children find out they like green beans and carrots after all, at least the homegrown variety. Birch Community Garden got its start in 2009 after then Corps Officers Captains Tom and Laura Fenton envisioned turning the rear parking lot into a garden that would draw community members together—a place where those experiencing need could grow their food. In the last decade, that’s exactly what’s happened. The 100-by-50-foot garden grows myriad healthy vegetables, including squash, potatoes, peppers, eggplant, cucumbers, carrots, radishes, kale and more each growing season. There are 14 community plots available to locals who, for a small fee and some volunteer hours, grow their own food. With the volunteer hours, the gardeners help maintain three main plots where they grow vegetables specifically to be donated. Those donation veggies are offered to The Salvation Army’s after-school program first. Kelley Rawlsky teaches classes (weekly during the summer months; monthly in the winter) using a hands-on learning approach where students often make projects to take home to remind them of what they’ve learned, like egg carton caterpillars, garden stones, leaf rubbings and more. Using the Denver Urban Gardens youth education programming, the classes help strengthen the kids’ connection to nature, as well as help sharpen skills that will serve them in all aspects of their lives—improving their attention span, learning to work individually or as a team, increasing their sense of purpose and expressing emotion and creativity using an artistic outlet. “The kids really love the program,” said Captain Mark Czanderna, current Broomfield Corps Officer with his wife, Sherry. At the end of every growing season, the kids help put the garden to bed and do one final harvest. “The kids take every bit of it home, and it’s quite a bit,” Josephs said. Senior citizens living in the nearby Salvation Army Silvercrest Senior Residence, a low-income housing center, also enjoy the veggies all summer long. Some of the Silvercrest residents, like the Mus, a couple from Beijing, China, tend a plot at the garden. If there are more vegetables than the students or seniors can use, The Salvation Army donates the produce to the local food bank, Broomfield’s Fellowship in Serving Humanity (FISH). And there’s often extra. When Josephs first took over at the garden, they were lucky to get over 500 pounds of produce from the garden each season. Now, thanks to soil improvements and pest control—including a fence to keep rabbits away—they’ve harvested nearly double that, close to 1,000 pounds a year the past few years. Thanks to a $5,000 grant from the Colorado Garden Foundation, volunteers will be building 24 raised beds this summer with individual drip irrigation watering systems, filled with high-quality organic soil. With the improvements, Josephs hopes to increase the yield for this upcoming season and harvest at least 1,500 pounds of food this year. Part of the grant money is also being used to buy seeds, seedlings and plants, and to replace the wood chip paths with crushed granite. The improvements will help reduce the maintenance, allowing volunteers to spend more time working the donation plots, which should increase volume. This summer, volunteers will spread the old soil and add grass seed on a hill overlooking the garden and next to the chapel, where there are currently 11 donated picnic tables but no grass.